warning: Creating default object from empty value in /home/gheller/drupal/drupal-6.26/modules/taxonomy/taxonomy.pages.inc on line 33. Yesterday I presented an Ignite Talk at Ignite Seattle 12 on the topic of using SCRUM Project Management for wedding planning. I've heard people liked it, and some people asked me for some more information. The video will surely be out soon enough, and I posted my slides already. But slides without audio don't help that much, so until the video comes out, I figured I would post my notes. This is a bit of an "opening the kimono" moment. What you will see in the notes below, which I will not edit significantly from what I used to prep yesterday, is that I dropped alot as I worked toward the final genesis of the talk (if you were there, or when you see the video). I prepared my initial notes, which were more of a rough draft of an essay first, then produced my slide deck last week. I didn't finalize the notes until Monday, and polished the presentation on Tuesday. I'd say I spent about an hour per minute preparing which is in sharp contrast to my last Ignite Seattle talk in 2009 for which I probably spent 3 hours or more per minute of presentation. Here are my slides from my Ignite Talk on December 7th, 2010 in Seattle, "SCRUM Project Management For Wedding Planning"
Grab the slide for my talk on SCRUM Project Management For Wedding Planning over at slideshare. View more presentations from Gregory Heller. I want to thank more than anyone, my wife Hope, without whom none of this would have been possible. She was a fantastic partner in the wedding planning endeavor. I'm happy to share other gleanings about the wedding planning process for those going through it now. You can also check out our wedding website if you are interested. 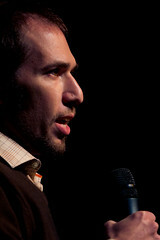 I gave an Ignite talk on Thursday night at the 2010 Nonprofit Technology Conference (10NTC) hosted by NTEN in Atlanta, GA.
On August 3rd I presented on the topic of Green Taxi Cabs at Ignite Seattle.